The astrogeographical position of Caracas and transits of the outer planets in relation to the government of Australia. Political astrology & history. This article is not finished – I`ll be working on it in the next week or so – please check out after some time how far I got in collecting data and information. Thank you!!! In political astrology the astrogeographical resonance degrees for capitals are to be taken as central indicating degrees for the situation of the government and the development of the nation and ist political structures. Astrogeographical position of the central area of the City of Caracas for morphogenetic field level 1 (global resonance) which describes the supraregional and international resonance topics of the capital of Venezuela, its government and political developments: the astrogeographical resonance coordinates of Caracas are 18°Cancer and 8°Scorpio. shamanism, knowledge, travelling and of liberal ideas. 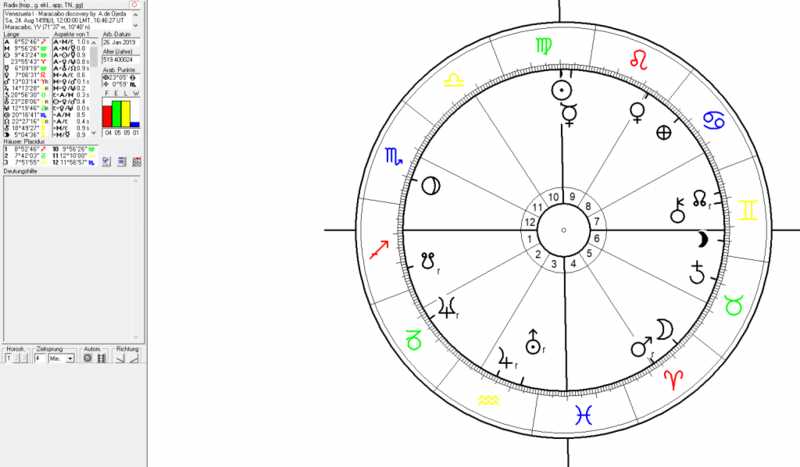 From the continuous presence of the degrees 18-20° in the 3 water signs Cancer, Scorpio and Pisces in the horoscopes for important events in the history of Venezuela (see below) it can be concluded that the coming Neptune transit over 18°-20°Pisces between April 2019 and January 2022 could bring about a process of liberation, reconnecting and self-finding in the political, social and cultural development of the country and nation. A warning here should be that the expectable restoration of democratic institutions and political liberation should not weaken and corrupt (Neptune) the autonomy gained during the Hugo Chavez presidency. This because Neptune trines in relation to the government seat can be expected to stimulate corruption of the government. Politically the Uranus phase of the Uranus square transit fell in the early phase of the Maduro presidency (since Januar 2013)) that followed the Chavez presidency (1998-2013). The Maduro presidency brought a period of economical decline and severe crisis right from its start in January 2013. 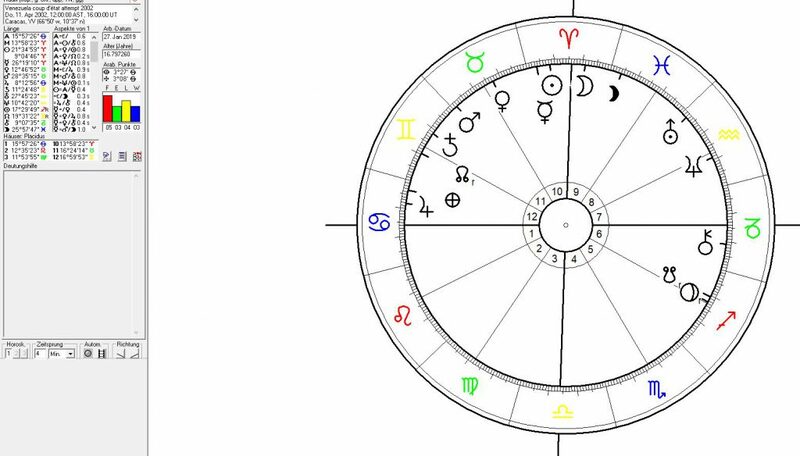 The transit of Uranus over the square position to the 18°Cancer coordinate of Caracas took place between July 2014 (16°AR) and July 2016 (20°AR) causing growing poitical unrest in the midst of economical crisis. Globally the Uranus return to fire sign Aries from the rise of the Nazi era (1927-34) saw the rise of the global neofascist movement promoted through a new dimension of globalized political propaganda and a new technical achievement: the social media. The Arabian “spring” a movement that caused the implosion of several countries spreading destabilization, civil war, terrorism and the refugee crisis in the Middle East, most African countries and Europe (EU, Ukraine, Brexit etc.). For evaluation of the potential effects of a Uranus square transit to a capital and from Aries the sign of warfare compare the Uranus square transits to Damascus at the start of Syrian Civil War in 2011 and to London during the “EU membership vote of June 2016” under the same overall constellation. In a positive sense Uranus stands for reconnection with the fuller potentials of a country and nation, self-liberation and self-finding. 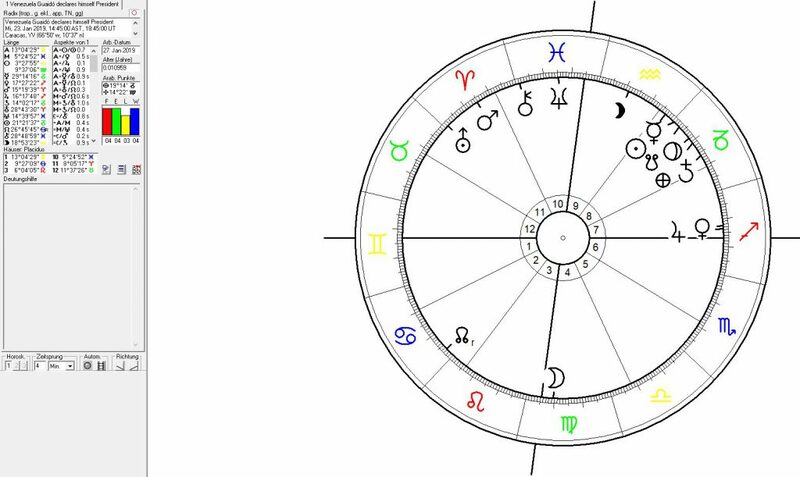 President Hugo Chavez who for some time took the role of a saviour of the venezuelan nation was elected president under a Uranus square to the 8°Scorpio resonance degree of Caracas from 9°Aquarius in 1998. But at the same time an important effect of the resonance of Uranus transits seems to lie in globalization, colonialization and foreign influence on a nation. The period of the Uranus square transit between 2014 and 2016 was followed by the opposition transit from Pluto. The transit of Pluto over 18° Capricorn in exact opposition to the 18°Cancer astrogeographical resonance degree of the capital of Venezuela between February 2016 (16°CAP) and November 2019 (20°Cap) has been accompanied by highest pressure on the government in Caracas. Pressure from the opposition and from the governments political, economical and ideological enemies abroad and in the country itself. In the run-up to the exact opposition transit the parliamentary election of December, 6 2015 were held. President Maduro`s party the Great Patriotic Pole suffered a serious defeat which mounted the pressure on the government in the face of a growing economical and political crisis. 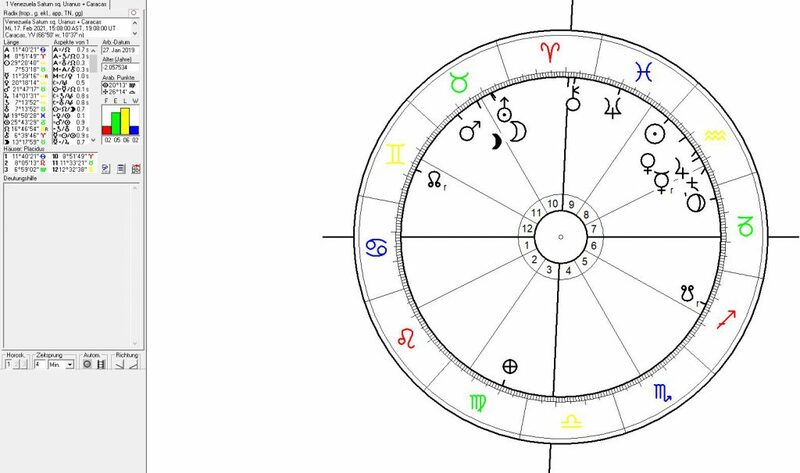 A new climax in the developments under this Pluto transit was reached on January, 23 2019 when opposition leader Guaidó declared himself president of Venezuela with the half-sum of the Pluto (21°CAP) – Saturn (14°CAP) conjunction in exact opposition to the 18°Cancer position of Caracas. The country seems to be on the edge of a civil war. The Moon in careful, self-protective earth sign Virgo is certainly a positive aspect for such a step whereas the Venus-Jupiter conjunction in Sagittarius on the stage of house 7 is to be seen as an aspect that speaks for highly populistic perfomance. Neptune in house 10 stands for the fact that the step has no direct legal effectivity. Mars and Uranus in Aries the sign of ignition, new starts, mobilisation and warfare in house 11 the house of uprisings seems a planetary constellation of revolution and an attempt for a coup d`ètat. The climax of the Uranus transit over 8°Taurus in exact opposition to the 8°Scorpio resonance degree of Caracas will take place between August 2019 and May 2021. Uranus the planet of reconnection with a countrys fuller potentials in Taurus the sign of money, markets, income, agriculture and possession of territory indicates threats to the economical independence through globalized hypercapitalism, business partners and the danger of selling out ones ressources. A deeper study of the astrogeographical transit situation should consider suggesting a positive approach to a cooperation and solidarity among equal partners esp. the south american nations and other friendly partners. A change of government, of political and esp. 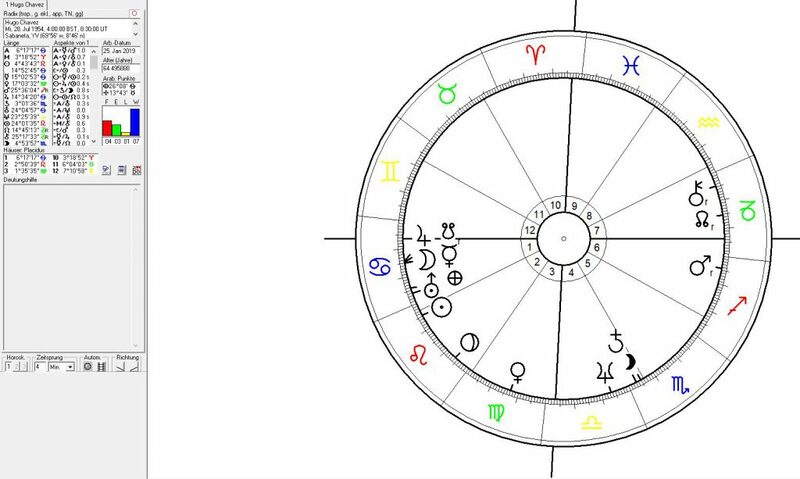 social and economical (Taurus) structures seems highly predictable judging from the current situation at the end of January 2019. A civil war along with the danger of a US american and military support for Maduro from Russia seem among the most probable and dangerous scenarios for the coming years. Climax of the Uranus transit in opposition to the 8°Scorpio astrogeographical resonance degree of Caracas: Astrological chart for the Uranus-Saturn square on 17 Feb 2021 calculated for 15:08. A major celestial event of maximal tension for the government in Caracas in regard to the astrogeographical transit situation will be the Uranus-Saturn square between 7°13`52 in Taurus-Aquarius on 17 Feb 2021. Saturn will be exactly square to Caracas and combined with a Mercury-Jupiter conjunction in Aquarius the sign of reconnection with ones fuller potentials, innovation and options for global cooperation. Sign ruler Uranus will receive further enforcement through the exact conjunction with ascendant ruler Moon in Taurus the sign of economy, income, wealth, markets and food production. It should be noted that pressure on the government through the local population should generally be positive esp. if the people make use of their rights to control the government. Pressure on the government and local people through interference from foreign countries has to be seen as negative – as it transfers the responsibility for the situation away from the homeland. The fact that so many planets are involved is to be seen as highly positive because it means that the pressure from globalization is not through a single partner or factor but rather through a more abstract or holistic global process. Birth chart for Nicolas Maduro calculated for 23 Nov 1962 at 21:03 in Caracas (source) with transits for the day he was appointed President of Venezuela on 16 Jan 2013 (outer circle). 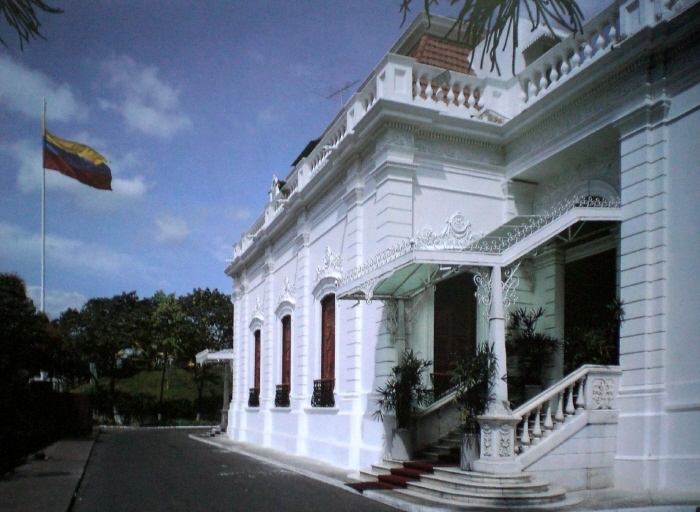 Nicolas Maduro was appointed President of Venezuela during the transit of Saturn over the 8°Scorpio astrogeographical resonance degree of Caracas indicating a process of consolidation of the political system at least during the first phase of his presidency. Pluto at 18° Pisces in exact trine to Caracas stood for the stimulative effect on the transformation of social structures as a major purpose of the country`s self-liberation. Pluto the planet of dogma and ideology in Pisces ths sign of the catholic church made his first return to that degree since the foundation period of Caracas in 1567 (see chart below). 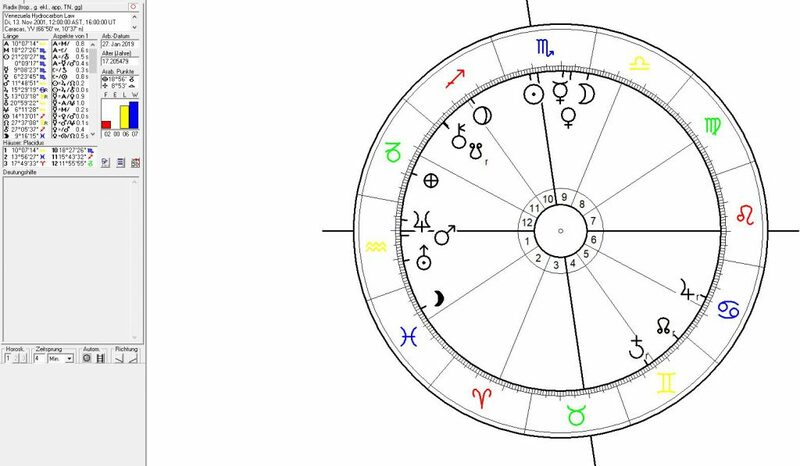 Hugo Chávez was born with a fascinating Jupiter-Moon-Mercury conjunction around 15° Cancer and conjunct the 18°Cancer astrogeographical resonance degree of the capital and seat of the government of Venezuela. Uranus the planet of rebellion, self-liberation and abolition of slavery was at 24°Cancer near the position of the capital. This overwhelmingly strong resonance with the astrogeographical coordinates of the seat of the government describes his lasting impact that on the history of his nation. This line-up in Cancer naturally relates to social and populistic issues in the first place. Particulary his attempts to strengthen the autonomy of Venezuela from the globalized hypercapitalism have to be related to Cancer as the sign of emotional identity and independence, feeling at home and identification with the nation`s ancestoral roots and cultural inheritance. Hugo Chávez was elected President of Venezuela shortly after the Neptune ingress in Aquarius and while Uranus the sign ruler of Aquarius was in transit of the square position to the 8°Scorpio resonance degree of the capital from 9° in Aquarius the sign of revolution, self-finding and reconnection with the fuller potentials of any system. The Uranus square to the seat of the government explains Chavez fundamental and to some extent revolutionary ideas and his attempt to radically liberate/separate the country from the grip of global hypercapitalism. The effects of Chavez policies as reflected in the Uranus transit must have been stimulative for some progress in the development of the nation and country but turned out highly negative for other aspects. The Mercury-Pluto conjunction of Chavez` rise to power and in Sagittarius the sign of preaching suggests that propaganda, manipulation and trickery were a major factor in his road to success. The political education, knowledge and experience from 140 years of socialist movement seem to be included. 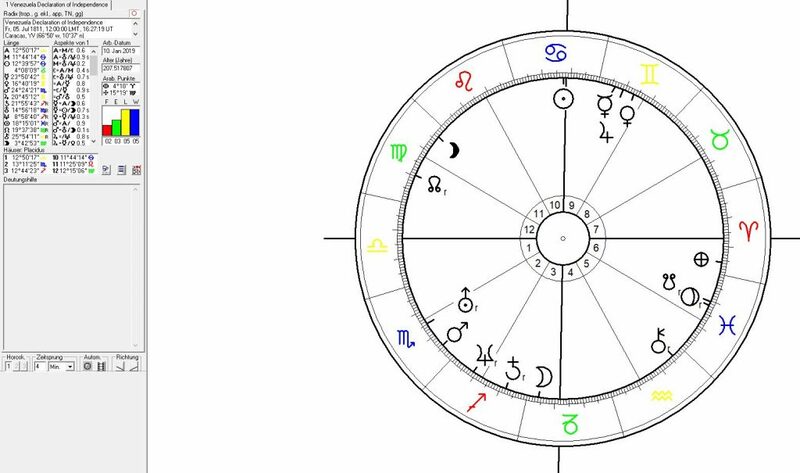 I find it fascinating that again the 20° Pisces position from the foundation of Caracas in 1567 and from the declaration of independence during the Pluto return in 1811 was occupied by a major planet. This time by Jupiter the planet of success and victory. From the continuous presence of the 18-20°Pisces resonance degrees in the charts it can be concluded that the coming Neptune transit over this position between April 2019 and January 2022 could bring about a process of liberation and self-finding in the political, social and cultural development of the nation. The Hydrocarbon Law was passed under a highly profitable and supporting conjunction of Venus (6°SCO) the planet of money, wealth, income and territorial possession with Mercury (9°SCO) the planet of intelligence, learning and cleverness over the 8°SCO resonance degree of the venezolanian capital. But at the same time the fact that the decision was made during a conjunction of Mars (10°AQU) with Neptune (6°AQU) with its half sum exactly square square Caracas (8°SCO) shows the weakness and threat to the autonomy of the Chavez government under which the Law was passed. The Venezuelan coup d’état attempt of 2002 on 11 April 2002 that saw President Hugo Chávez ousted from office for 47 hours before being restored to power with the help of overwhelming popular support and mobilization against the coup and through assistance of loyalists in the military. 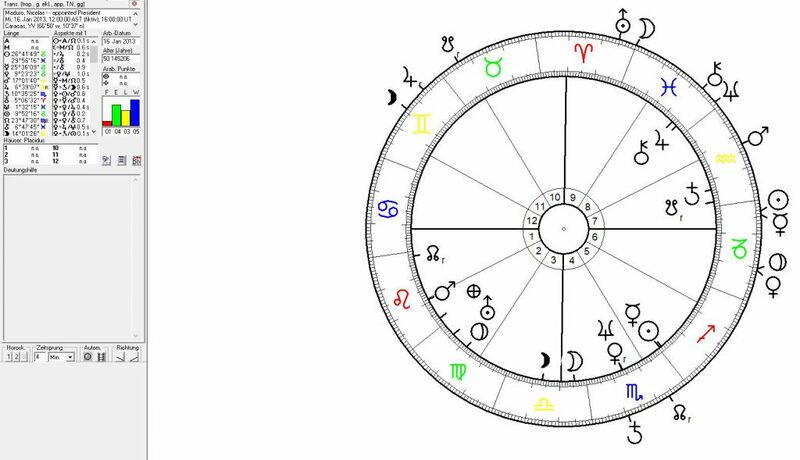 Astrological chart for the coup d’état attempt on 11 April 2002 calculated as a 12:00 noon chart. The coup d’état of 2002 was carried out with Neptune at 10° Aquarius the sign of revolution challenging the 8°Scorpio astrogeographhical coordinate of Caracas. The pressure from Neptune the planet of idealism can be interpreted as a hint at the weakness of the political system caused by the idealistic approach to the anticapitalist reforms carried out by the Chavez government. Especially Chavez` attempts to favour the country`s independence against the foreign control over the oil producing industry can be understood through this neptune transit. At the same time Neptune himself was under pressure from a square from Venus at 12° in earth sign Taurus the sign of money, profits, markets and possession of territory. Jupiter the ruling planet of Sagittarius the sign of hunters and collectors, profit orientation and success was at 8° Cancer and conjunct the 6° Cancer astrogeographical position of Washington. This transit is a hint at the support of the US government in the coup. The NY Times, The Guardian, Newsweek and many other newspapers published evidence of the involvement of the Bush government in the coup d’état. At the same time Jupiter was in exact trine (supporting aspect) to the 8°Scorpio astrogeographical resonance coordinate of Caracas indicating support for the government from the local population. 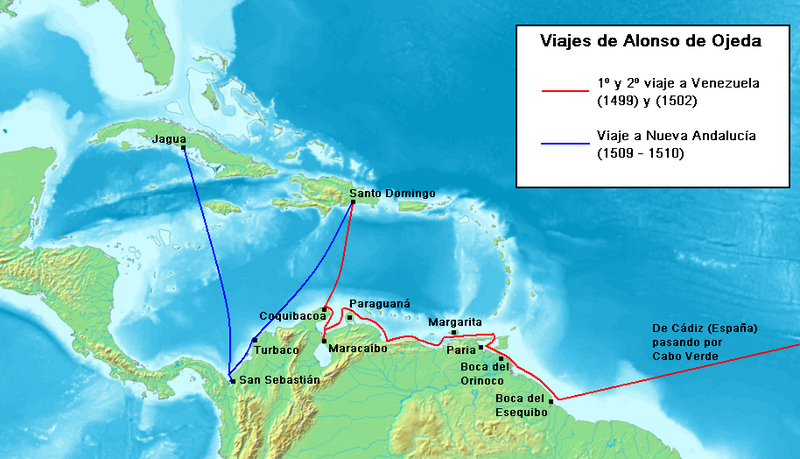 On August 24 1499 the Alonso de Ojeda and Amerigo Vespucci expedition discovered the passage to Lake Maracaibo which brought a major step in the spanish occupation and colonialization of Venezuela. It can be taken as the birth date of the spanish colony of Venezuela. 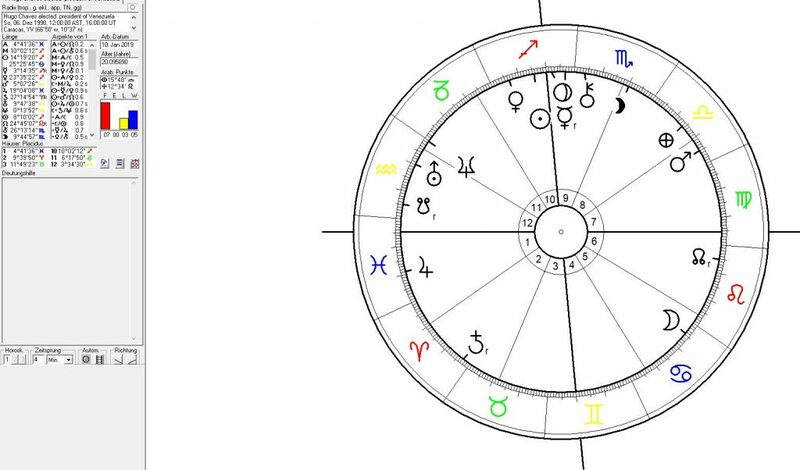 Venezuela I: the birth date of the spanish colony: Astrological event chart for the discovery of Maracaibo calculated for August 24 in 1499 (jul. date) for 12:00 noon. 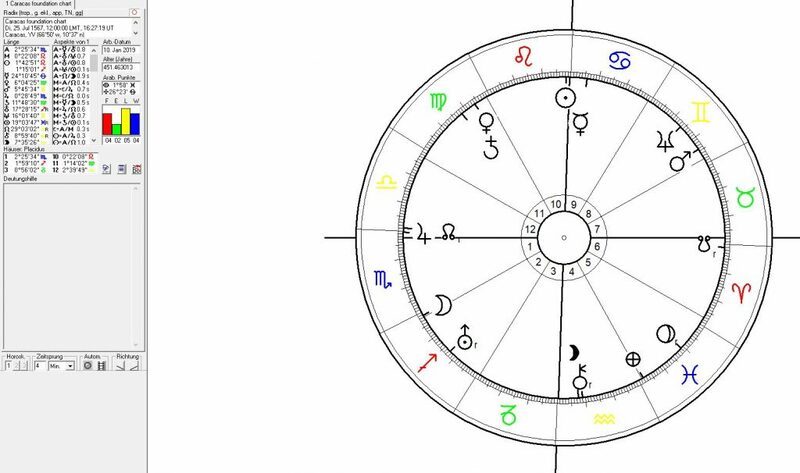 The first major step in the colonialization was made with Pluto at 20°Scorpio occupying the Scorpio end of the grand trine with the 20°Pisces and 18°-20°Cancer positions that seem so important in the history of Venezuela. But Pluto although to some extent supportive of the independence was under heaviest pressure from a Jupiter – Uranus conjunction between 14° and 23°Aquarius in a square and from Saturn at 20°Taurus in an opposition. The pressure from Uranus can be seen as a sign of the “holistic” influence of globalization, foreign attacks from “outer spaces”, modernisation and the change of the traditional system. The pressure from Jupiter may be examined as a trait of the explorer´s aims of treasure hunting and seeking success, fame and wealth at the costs of the local population. The first declaration of independece of Venezuela from Spain came with strong and highly stimulative Uranus aspects conjunct and trine the astrogeographical resonance coordinates of Caracas. Uranus the planet of self-liberation was at 14°Scorpio and near the 8°Scorpio coordinate. That means that the process of gaining independence from the colonial power was apparently begun as a consequence of Uranus` transit conjunct the 8°Scorpio coordinate of Caracas since 1809. By 1811 Uranus was about to move into a trine to the capitals 18°Cancer resonance degree psitively stimulating growth and autonomy. 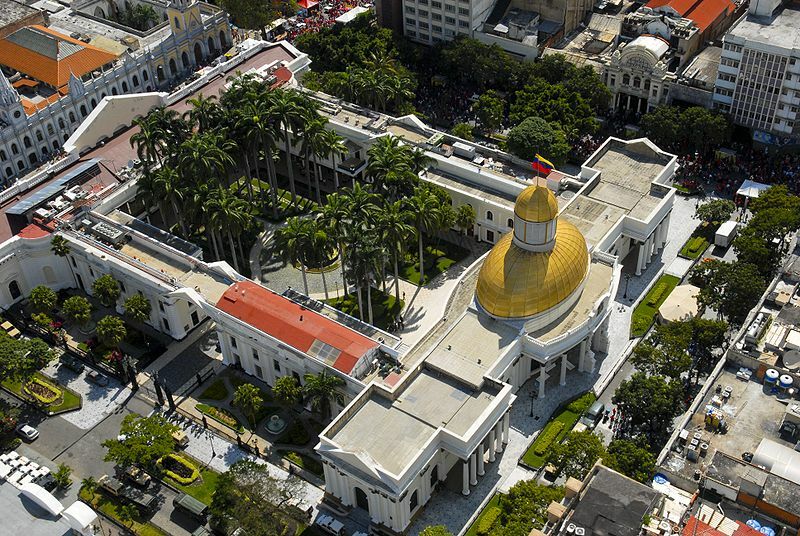 Caracas was founded with Pluto at 18°Pisces in exact trine to the 18°Cancer astrogeographical position of the central town area suggesting transformation of the landscape, social structures and hierarchy as a major issue in the development here. Pluto can be understood to stand for the aggressive ideological and propagandistic influence (Pluto) of the catholic church (Pisces) used by the spanish invaders for stabilization of their dominance over the colony through their appeal to dominance in the field of spirituality.